In the digital world, the need to protect online communications increase as the technology behind it evolves. There are many techniques currently available to encrypt and secure our communication channels. Data hiding techniques can take data confidentiality to a new level as we can hide our secret messages in ordinary, honest-looking data files. Steganography is the science of hiding data. It has several categorizations, and each type has its own techniques in hiding. Steganography has played a vital role in secret communication during wars since the dawn of history. In recent days, few computer users successfully manage to exploit their Windows® machine to conceal their private data. Businesses also have deep concerns about misusing data hiding techniques. Many employers are amazed at how easily their valuable information can get out of their company walls. In many legal cases a disgruntled employee would successfully steal company private data despite all security measures implemented using simple digital hiding techniques. Human right activists who live in countries controlled by oppressive regimes need ways to smuggle their online communications without attracting surveillance monitoring systems, continuously scan in/out internet traffic for interesting keywords and other artifacts. The same applies to journalists and whistleblowers all over the world. Computer forensic investigators, law enforcements officers, intelligence services and IT security professionals need a guide to tell them where criminals can conceal their data in Windows® OS & multimedia files and how they can discover concealed data quickly and retrieve it in a forensic way. Data Hiding Techniques in Windows OS is a response to all these concerns. Data hiding topics are usually approached in most books using an academic method, with long math equations about how each hiding technique algorithm works behind the scene, and are usually targeted at people who work in the academic arenas. 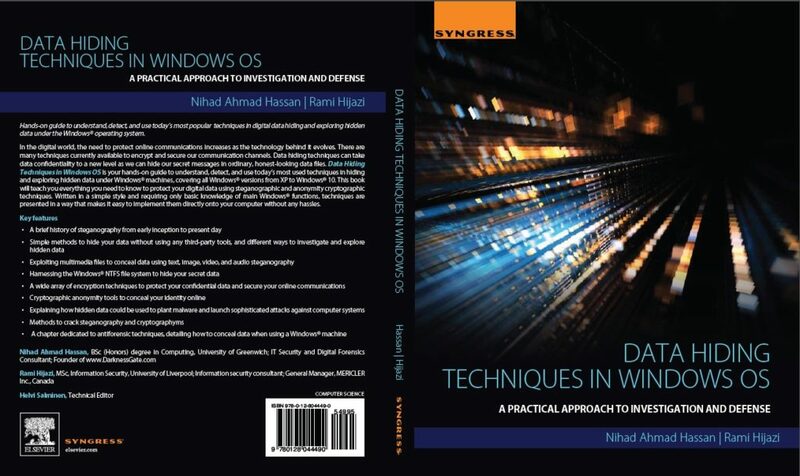 This book teaches professionals and end users alike how they can hide their data and discover the hidden ones using a variety of ways under the most commonly used operating system on earth, Windows®. This is your hands-on guide to understand, detect and use today’s most popular techniques in hiding and exploring hidden data under Windows® machines, covering all Windows® versions from XP till Windows® 10. Starting with the Roman Emperor, Julius Caesar, and his simple cipher method to the surveillance programs deployed by NSA, to monitor communication and online traffic, this book will teach you everything you need to know to protect your digital data using steganographic & anonymity cryptographic techniques. Written in a simple style and requiring only basic knowledge of main Windows® functions, techniques are presented in a way to easily implement them directly on your computer. In the following you will find a brief description about each chapter’s contents. Chapter 1 (Introduction & historical background): Talks about history of data hiding since old civilizations. It presents historical events related to this subject. This chapter begins by listing old cryptographic techniques used in ancient times to secure message transmission, it then discusses modern steganography and encryption techniques used in today’s world. Chapter 2 (Data hiding using simple methods): In this chapter, we present many simple techniques that an average computer user can use to hide their personal data. The techniques presented in this chapter can be used without using any third party tool. Chapter 3 (Data hiding using Steganographic techniques): In this chapter, we present different Steganographic techniques to conceal our data in multimedia files. We demonstrate how we can use different tools & techniques to conceal data inside e-documents, web files, images, audio and video files. A brief discussion of how each technique is working behind the scene is also included to make this chapter informative and practical at the same time. Chapter 4 (Data hiding under Windows® OS File Structure): This is an advanced chapter that shows how we can exploit Windows® OS NTFS file structure to conceal our data. Many data hiding techniques in this chapter can be performed without using third party tools, mostly by exploiting Windows® OS own files. This chapter gives insight on how hackers can use data hiding techniques to launch sophisticated attacks against computer systems and private networks. Chapter 5 (Data hiding using encryption techniques): This chapter presents different techniques to protect your private data using encryption. It covers encrypting a Windows® partition, data disk and files in addition to emails, IM and VOIP calls. Attacks against full disk encryption and countermeasures also described in this chapter. This chapter also covers using cryptographic anonymity techniques to anonymize your online communications making it untraceable. This chapter can be read alone, in fact, you can consider it as a mini book dedicated to teaching you practical tricks and guidelines for online risks and steps to protect yourself against cyber-attacks through encryption and cryptographic anonymity tools. Chapter 6 (Data hiding forensics): This chapter is the reverse of Chapter Three & Four as it looks into how data hiding forensics investigate different methods to detect concealed data in digital files and Windows® file structure. In addition to this the chapter illustrates how one can investigate Windows® based machines to determine whether there are any steganography tools have been installed or used. Chapter 7 (Anti-Forensic techniques): This chapter discusses techniques and gives advice on eliminating your traces when using steganography tools to conceal secret data. It also presents ways to prevent general computer forensic tools from investigating and exploring your hidden data. This chapter is the reverse of Chapter Sixth. Chapter 8 (Future trends): We discuss future trends and advancements in digital data hiding and how new IT technology’s effects on this subject.